T-Mobile is now offering its Magenta Friday deal that’ll get you two lines for free. The offer is available wherever T-Mobile new lines of service are available, including T-Mo stores, Costco, customer care, telesales, authorized postpaid dealers, and T-Mobile’s website. With this offer, new customers signing up for two voice lines on a Simple Choice or T-Mobile One plan can get two additional lines for free after monthly bill credits. The first two lines must be voice lines, but after that, you can get voice, mobile internet, or wearable lines for free. Existing Simple Choice and T-Mobile One customers are also eligible for this promo. Keep in mind, though, that if you’ve already got one line free because of a previous promotion, you can only get one extra line free. There’s a max of two free lines per account. Finally, these free lines are good for as long as you maintain qualifying service and stay on your current plan. If you cancel service on any lines or switch to a non-qualifying plan, you’ll lose your monthly bill credits. T-Mobile will offer fourth line free deals every now and then, but this two lines for free promo is a bit more special. The deal will only be available from today until Sunday, November 20, so keep that in mind if you’re thinking about taking advantage of it. Agreed… used “FREESIM” to get save $20/line for the sim cards. If you are adding a line without buying a device (sim card only) be sure to use promo code FREESIM to get out the door for $0.00. do you know if it is supposed to show up at checkout as $10 add a line? I have the free sim card but it shows that it will increase my bill by $10 for each line. Mine was showing up as adding $0 per month when I added two lines. I would call or chat with them to confirm that you qualify before ordering. No, mine showed up as adding $0 per month for the line fee. Thank for the responses, i contacted them and they said it was free but it still shows up as $10. Can business customers count their work line as the 1st for this promo? Can someone please help me out. I called in and they told me I need to add a line to get a free line. I already have 8 lines. Bull. On periscope Mike and John said you don’t need to add anything. Just request the free ones. Grammar can be misleading to those who don’t read to comprehend. Dammit… The deal is add 2 lines for free through bill credit and not ” Get two lines free on your account. Come on people… Stop being so freaking greedy gosh.. You already have great prices with Tmobile and yet you are still not satisfied with freebies. Gosh.. So you are most likely on the 4 for 120 plan with 10gb of data. This plan is already getting 1 free number which is number 4. So you can get 1 more number for free without doing anything. You just add the number. You have to add the lines for them to be free, you can’t request 2 existing lines on your account be free. What benefit would tmobile get if people could just call in and get 2 previous lines for free. I’m not trying to replace my current lines for the free lines I want to add two more. I’ll just go to the T Mobile store and ask them. Hmm I’ll test it out online, but I foresee some catch due to my 4/100/10. Hmmm… online shows adding lines at $40/mo each. Not unexpected as I’m on the Simple Choice Unlimited promo 2/$100… Chat claims I should get a bill credit for them, but not sure I want to risk it.. Maybe I’ll try calling or going to a store in person. have you tried any store yet? No, just the my-tmobile website. I’ll post if I can get a store to do it. The customer service chat claims I should get credit for it, but these promo plans sometimes aren’t eligible. Just got done at the store. The 2/100 plan qualified and I walked out with 2 sims ready to go. I did pay 20/ea for the sims, but for 2 free unlimited lines, I’m good with it. I just left a T-Mobile store after returning the old phone and they weren’t sure but didn’t think it would be allowed on this plan because it’s a promo plan but haven’t read anything else online. 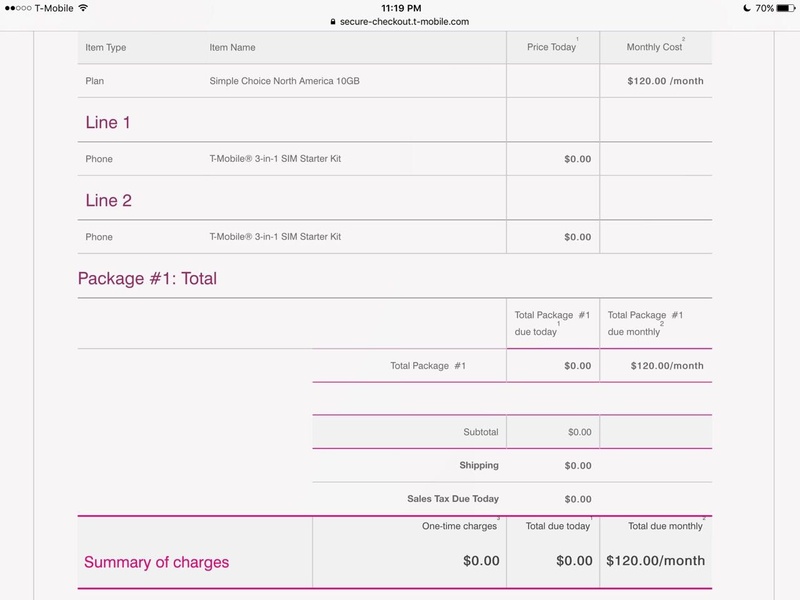 4/100$ true unlimited with tethering is a freaking steal of we can get it. Changed monthly charges for additional lines and plan changes. These charges will be added to your monthly bill. Seems it add $40 for each line even if it original says no charge for each in the previous page. i just tried also….i also have the Simple Choice Unlimited Promo, and it wants to add $40.00 upgrade for each additionsl lines per month. I guess the Simple Choice Unlimited Promo customers are exempt from the awesome deal. We have been black listed !!!!!!!! I wonder if i cancel one of my lines and then try to get the new one if it will come out to be free????? Can anyone clear something up. I have 5 lines on the 2.5gb plan (currently 4gb for $110 total). If I get the two free lines and add a 6th and 7th line, then at some point in the future I decide to get rid of the 5th line, then I lose the free credits? P.S. The S6 trade in for a S7 and Gear VR package next week sound like a good deal I plan on taking advantage of too. Bought the two S6s in the summer during the T mobile gift card BOGO, with the additional Samsung $150 per phone rebate. That means in the span of a couple months I was able to turn $300 into two S7s with a Gear VR package for each. Not bad. From the conversation i just had , if you did then you would not be able to keep those lines , but you never know being a customer for almost 15 Yrs one thing i learned is theres no such thing as You can’t or that’s not available for you , but sometimes just whom you speak to some of those CR rep’s know how to do thing’s they shouldn’t …. I talked to an employee today and they said the free line can also be doubled up with one of their free phone deals, so you can get the lines up and running with no actual cost (maybe taxes). Hmmm gonna have to look up those free phone deal’s….i know HTC is offering the phone i just traded in the HTC 10 for like 349.00 or something like that …………..I loved that phone and may consider buying it back at that price…………..
On the Periscope John Legere said for 4/$120 you can only add 1 more free line since $120/4 is already has 1 free line. I don’t know who is correct, John Legere or the rep who added 2 lines for you. Online, it allowed me to add 2 lines to my 4 for $120 with 10gb simple choice. And the SIM cards were free using FREESIM. When I called, the rep said as long as the order was placed this weekend the offer will stand. I did the exact same and got 2 free phones with the lines while keeping my same plan. Pretty amazing! Not one cent spent. What phone did you get? How’d you pull that off? I honestly did not even ask about the phones ,she brought it up. what plan are you on because that plan sounds like a plan where you are already getting the 4th line for free which means you can only get 1 more free line not 2. I would double check. I have the 2/$100 unlimited plan. I don’t need to more phone lines, but you think I could add the lines and use the SIM cards in a 4g tablet? Why not? The numbers can also be used to redeem one-hour wifi on Gogo. The sim cards themselves are set to a phone number. If the phone number indicates that it’s for a phone, it will only work on a phone. Do not try to put it in a tablet. However, if that sim card is set to a tablet line number, it’ll work perfectly fine. For this case, the promotion is allowing for the free lines to be phone OR tablet lines, so Mike would be able to activate 2 tablet lines for free, or 1 phone and 1 tablet line or 2 phone lines. Imho, unl data phone lines are usually the most expensive, and with this plan, it’d normally cost $40, so I’d suggest he get 1 tablet and 1 phone line, to keep for possibly future needs. He may not need it now, but he might later on and it’s a great deal to take advantage of. Thanks. Do you know what the Tablet plan would be? How much data? I’m thinking I may just get the two phones and just get the largest cheapest 4g phones I can find for my 7yo son to use as a “Tablet.” Then when he is old enough for a real phone, I’ll already have the plan in place. I am assuming my plan will go up slightly because I will have to pay the fees and taxes on the 2 additional lines. Tmo stated that the first two lines must be a phone line, but the other two *free* lines may be phone OR tablet lines so you should be fine, as long as your understand that you’ll get charged first, then get reimbursed with credits for the “free” lines. I have the 2 lines of 6gb for $80 simple choice plan. If I added two more lines, would they be at 6gb each too? That’s what I was told too. I’ll just call and ask them to manually do it. I’m sure they can. Just got off the phone with CSR. I had 2 lines for $100 with unlimited voice/text/data + 7GB tether. I asked for the promo, and I got 2 lines added with complimentary expedited shipping on 2 free SIM cards. I quite sure, you pay for the data. Lines are 10 bucks. It’s a trap to lock you into the service and then they will hit you. They won’t be free my friend, your bill will prove my words next month. I am on the 4/120 10GB each plan, I was curious about the free lines I could add. Went online to check, and it let me add the 2 lines with freesim for no extra charge. So I just wanted to validate, so I cleared the cart and tried 3 lines. When I got to the end of the process the monthly for all 3 was also free. So then I tried with 5 lines, and same thing it showed all 5 free of monthly fees. I am thinking something is messed up with the site. That’s what happened to me. I called them and they said my order went in fine. And I saved the order and they also seen the order. So, I’m not too sure what to make of it till I guess the next bill comes. with the 4 for $120 plans with either 6 or 10gb, the 4th line is considered free and you’ll only receive one additional line for free. That’s what I figured. But then I was told a different thing by how it is billed as a package and it’s not receiving credit because all my lines show up as $0. And the account has a $120 charge. Since the website is evidently messed up since it would let me add 5 lines for free. I decided to call in, and they let me add 2 lines. I’ll give them a call to verify. I know my voice lines all have some monthly taxes and fees on them, but do tablet data lines also get taxed each month? The tax yes. Perhaps. But the fee no. The fee is for voice. plan for tablet which is like $25/month but that would be free on a new line. I asked, are you sure on my 2.5gb plan that I can get a free tablet with 6gb data plan for free? She said, yup, it works. I went online and the order shows free sims cards but list $10 for monthly line 1, $10 for monthly line 2. Change from $100 per month to $120. I’ve had bad prior experiences with customer reps where they assured me that a promo for iphone would work from 4-5 different reps even though the order and paper work didn’t match. After couple months of higher than expected bills, I had to talk to 3-4 additional reps where the last one spent 1 hour with me and told me the original 4-5 reps were wrong and your stuck with the higher bill. The online order tells me that I will be charged $10 more for each of the two new lines which I’m hoping are free. I’m not sure what to believe. I have a bad feeling about this. It’s free with bill credits. You will see $10 charged for each tablet but there will be a $10 bill credit shown on your bill when it gets generated. Also you should have been advised that it may take two billing cycles to start seeing the credit. I wouldn’t worry about it if I were you. That’s what is frustrating, depending on who you talk to, you get different answers and there isn’t a definitive website with all the disclaimers and detailed information. I called back to tmobile this morning, (3rd) customer rep did verify that 4/$100 promo is not eligible to get 2 free voice lines and that the 2nd rep who added the lines did not know. I asked to cancel the order for 2 lines as they wouldn’t be free. I told 3rd rep that 1st rep told me if I changed to the old 2gb family plan, that I could get the additional 2 lines for free. They looked into with retentions to change to old 2gb plan to see if that would work and after talking with their manager, came back and told me manager said it was okay to get 2 free lines on the 4/$100 2.5gb promo. They got a special code? to enter to make it work? I asked them to note my account that it would get the 2 free lines, hopefully they did enter it. So in the end, it seems to work, to get 2 free lines on 4/$100 2.5 gb plan. I’m not sure if a special code has to be entered to make it work. I hope I really have the 2 free lines because sometimes things get messed up by customer reps, I know because I’ve been in nightmare scenarios with them. 2nd rep told me that I could get 6gb data line for free as but by this time, I didn’t want to push my luck. I currently have 5 lines, I added 5th line one week ago – I wish I didn’t – as I have to figure out when I can cancel the 5th line. I have had bad experiences cancelling additional 5th lines in the past where I have been threatened by retention that I would lose my family plan if I did. After talking with manager, he apologized and cancelled 5th line in the past without affecting my family plan. I’m hearing something about not cancelling any lines for 90 days from reps but I’m not sure if that’s legitimate information. Also, the 2 free lines can get LG K7, K10 for free but locks you into 24 month agreement. Terms and conditions state new free line(s) must be activated during the promotion period and by 11/20/16. It’s likely the SIM Kits by mail will arrive several days after the promotion period? I called Care and they said it’s true that for those of us that are waiting for a SIM kit my mail line activation will be happen once the SIM is deployed. However, the Care Rep then stated T-Mobile recognized the “dilemma” and has extended the period for required activation for several weeks. Exact end date was not stated. Do not do this unless you are a new customer with no cancellations before and after this for 90 days and be warned if you are an existing customer you will be in pain. They screwed up and if you did do this and are an existing customer watch you bill statement. Be very careful. And if there is anything weird call in right away and make sure everything is ok and that you were eligible. Thanks brad for the heads up i agree with you on that part but CS screw everything up doesn’t matter what you asked for. I would apply that advise to everything you do with T-Mobile. Still can’t beat 4 lines $100 unlimited everything and 7gb tethering. Yeah, you can’t say that without providing some justification. This looks like one of the best deals in years for me. I’m looking to have four 6GB lines for $80 per month. Only $90 total after taxes. That is CRAZY good. All right, I pulled the trigger! Added 1 voice line and 1 tablet line for free! (well, monthly tax on the voice line). Prior to this addition, I have a Simple Choice plan with 5 lines (2.5gb each that have been upgraded to 4.0gb until March 2019) and 2 tablet lines that just have the free 200mb/mo. I also still have a 15% corporate discount in effect. Started the process by logging into my acct and chatting online. At the end to confirm what I was adding, the rep called me and we completed the details over the phone. * Added the tablet line. I went with the 6gb plan which becomes free ($35 minus $10 like all tabs get when added to a voice plan minus $25 for the promo). No taxes to be applied to that line. * Each of the $20 SIM fees were waived. * Shipping out free overnight (prob Tue due to weekend) so I have them active prior to Black Friday. * Rest of the plan is left as-is, 15% discount remains in effect, and my bill will go up only by about four bucks a month. I have the same 4/$100 @2.5 gb plan. For the mobile data plan at 6gb, are you sure you will get the full $25 credit back. I was reading the details on tmobile website and if you have mixed data on your voice plans, you will get a new voice line with the lessor data, i.e., if you have a 2gb and 6gb data on your phones, your new voice plan will get 2gb. If you want the new free line to have higher data beyond the lowest tier, then you have to pay the monthly difference in cost. The mobile internet is different but I would think that same rules might apply. Customer rep also reported to me that I could do the same thing, get a data line for 6gb (binge on) and that it would be free. I really did want to get the 6gb mobile data plan because it would have been great to have free binge on but I didn’t want to push my luck. I hope it works out for you. The rep told me that all tablet plans are discounted $10 when added to an existing voice plan. Additionally, with this weekend’s promo, $25 max can be applied to any of the tablet data plans, thus making the 6gb plan free. thanks! I got two free data lines with 6GB free data each line. I am not adding anymore lines with them. I am done with this shady business. I don’t get service at my work, and they try to sneak in random charges every month. I have finally paid off all my phones, and just have 4 lines with grandfathered unlimited data. I’ll stick to this company until they will offer Unlimited. If they pull the trigger on that Dataplan, i am flying to verizon. I have been with them almost 11 yrs. Just spoke with a rep and they said the simple choice promo 2/$100 deal is able to pick the 2 free lines! If I add a talent the data plan would be the 6gb option since the max for a data plan they can give is $25. Might be dropping by a T-Mobile store. 4 lines unlimited everything with the ability to turn binge on, off. And 7gb tethering for $100!! Rediculously cheap! yup you are on the best of all the plans to do this with. Great price for 4 lines. Ran into my corporate store yesterday to take advantage of this. The 2 for $100 Promo was already a great deal but to not make it 4 for $100 would be insane. Testing out the BlackBerry HUB using my old Galaxy S5…..all of you old BB users will love this. Right! Still trying to talk my other half into it. But we know no one that would want to join on our plan. But it’s free other than maybe the first or second month till the promo actually kicks in. The promo pricing should kick in immediately. You should not be billed for anything since it’s not like an EIP promo where that can take a month or two. If you already have the 2 for $100 promo, just add the 2 lines and worry about using it later on. It costs you nothing!! Some newer cars have a slot for a SIM card so you can use it for that or throw one in an older phone, like I did, and you can even just carry that around and use it as a hotspot. Do you know if you can get a free tablet with one of the extra lines? Yes, it’ll come with the 6gb data plan for free too. They’re never free. Check your bill, you must have equipment month pay thingy on your bill. I currently have 4 lines unlimited for avg. $35 per line after bill pay is auto on. 4th line free. Can I chat with T Mobile online and lower my bill to $30 per line? No you dont have to change your plan.Just make sure that your grandfathered plan didnot include any free line.If it does,then you can only add only one more free line. I have4/$150 unlimited plan & my plan already include one free line,so I was only able to add one more free line. Thank you very much! I was able to reach customer service and they, assured me of the same. Also, do you have unlimited data on each line? I was told it would be an additional charge for unlimited data, which is still a good. What grandfather plan do you have. I was told that you either need to have simple choice or one plan. After processing my order with 2-additional lines on top of my current 4-Simple Choice plan (10GB x 4 for $120/month), I haven’t seen the main page show Lines 5 and 6. Do I have to wait until I get the SIM cards in the mail? Or could I use existing (non-expired) SIM cards I have at home to activate Lines 5 and 6? You are only going to get 1 of those two lines for free because you are already getting the 4th line for free on your current plan. Unless you already knew this I would call back. And yes the lines will not show up until the Sim cards ship. If you are really an employee your the reason there are problems with promos because you do not read the terms of them and get ppl to do things they can not. Plz do not give out false info. Every plan that T-Mobile is giving a free line on already is only able to get 1 more free line. The plan 4 for $120 with 10gb of data is a Promo plan with 1 free line already. It is the same plan I am on and you are only able to get 1 free line because you are already getting another free line. If you got two more free lines that would put you at 3 total free lines and the promo is only for a MAX of two free lines per account. Your information is also incorrect. I have a 4 line 10gb $120 promo in 2015 but that deal was before the 3 lines get 4 line free deal which was somewhere in the middle of this year. What I’m saying is depending on what promo you got, you could have one or two free lines for free. My plan like I said is a 4 line 10gb for $20 and It gave me the option to add 2 free lines to. Yes It is the same plan I am on and I am getting my 4th line for free. So I would keep an eye on it because I know that my plan is not able to get more then 1 line for free. Is yours the family match or the one before they did the family match? Not when it was 10gigs for all back in early 2015. Family match came about when BingeOn was announced in November 2015. That’s what the rep at my local store was telling me. That the way my bill is is 4 lines for $120 not 3 lines 1 free. The 4 lines 10gb plan is not a 4th line free plan, it’s a 4 for 120 promo plan so you can get 2 additional lines for free. Incorrect. The 4 lines 10gb plan for 120 is a 4 lines promo plan, not a 4th line free plan. Call customer care, 611 from your cellphone and speak to a authorized T-Mobile rep, or go onto facebook and send T-Mobile a message and that way your not getting misinformation and you can get the correct information. This site is a forum and is not run by T-Mobile. Can anyone confirm that you can get free data/tablet lines? If so what data cap is given on the tablet lines? Yes tablet lines qualify as long as you have at least 2 voice lines on a qualified plan. Max free data line is 6gb plan or T-Mobile one. Had a $100/month plan for 4 lines. Switched to T-Mobile One for $120 a month. Great deal imo. Btw, you can also get that T-Mobile SyncUp Car thing for free. Plan and device for free! Yes you can do it on the phone or in store. I have the same plan and successfully added two free lines with two free SIM cards. What data do they get? Do they also get unlimited since you are on the unlimited plan. The 2 free lines get the same unlimited data as the 2 for $100 lines do. Great deal since additional lines on this promo are normally $40 each since it literally includes EVERYTHING (unlimited 4G LTE, tethering, international data roaming, etc.). They get the exact duplicate of what my original lines have, unlimited high speed and 7GB high speed tether. Just now two more for free. Ok, pulled the trigger. I had the 2/$100 unlimited plan and added 1 unlimited voice line and 1 6gb tablet line. I also got the LG G Pad 8X tablet for free. The tablet was on backorder, so I have to wait until Dec to get it. But that’s ok, it will now be an xmas present. So quick question, was the 6gb tablet line totally free as well, or did you get the T-Mobile Sync Up Drive free and you have to pay for the 6gb plan? A store rep told me that they can give a 6gb plan free as one of the free lines but customer service said the free lines are only for voice lines. My understanding is that you are eligible for two free lines. Those lines can be tablet lines (the 6gb plan) or voice lines (based on whatever line is the “lowest” on your current plan) or 1 of each, which is what I did. Do you know if 2 Voice lines and 1 Tablet line will still qualify at least for the extra free tablet via credits line? You only get two free lines. Not really sure what you are asking. You can add 3 lines (2 voice and 1 tablet), but one you will have to pay for. The tablet is free regardless with the data plan since that is a different promo. The free phone requires the One plan. The tablet doesn’t have any special restrictions. That’s why I didn’t opt for a free phone. Great deal, great price for an old timer like me of eleven years with T-mobile. Go T mobile, thanks for your incredible and budget friendly deals! When you sign up over the phone reps, do you actually see the new phone numbers in your account? Or is that only after you get the SIM cards? Also, I have the 10GB Family Match plan with 5 lines ($120+$20) and the CSR said I can get 2 free lines. My order details show a SIM kit and 2 10GB voice lines and monthly cost of $0. But then the summary line below that says $40 due monthly. For clarification (suggestion only), please check with tmobile customer service and ask the representative to review your order and/or any details on pricing. He wouldn’t. Just kept saying thanks and this completes the call and wanted to get me off the line. mine isn’t showing up online either. my order shows same 2 new SIMs and additional line fees but my actual account just has the 2 original lines still listed. I was concerned since the promo says “activated” lines by end of Sunday. Now that we’ve been extended til Tuesday i’m hopeful it’ll show up in my account by then. if not i’ll be calling CS on Tues PM to make real sure it counts. News is promo is now till Tuesday! Out of the horses mouth on periscope. After reading additional information, I have a better understanding of the promo, more so for older grandfathered plans and the Data match. Per Tmobile site, if you have a Simple Choice plan, the two free lines will match your two voice lines. Also, If your voice lines have varying amounts of data, the free lines will be equivalent to the voice line with the Lowest amount of data per Tmobile. If you like more data, you will be responsible for paying the difference every month. I have 5 lines/$140 (10gb). So I should technically be allowed 2 more lines correct, both with 10gb data, right? Because 4 lines were included at $120 and then I’m paying the additional $20 for the 5th line. I have some comments to add regarding this promo on Magenta Friday and how Tmobile screwed that up. Because I was already a Tmobile customer they didn’t let me even thou the promo is for both existed and new customers alike. So a long phone call later I was allowed and a new account created to port 2 of my old # over. Then two new SIMs were ordered and will be mailed to me. I was able to see that on MyTmobile that the account was active. The other 2 SIMs took well over a week to arrived giving the holidays. I activated the new SIMs but long and behold, when the bill comes in later December, I am on a $120/mth plan. WTF? So I called to find out what happened to the 2 supposed to be free lines are now $10 each? Oh turns out 2 things they didn’t do right. 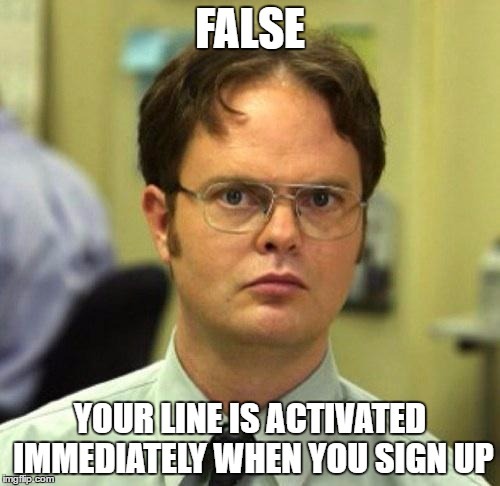 They never added the 2 free lines when I signed up. And then when I activate the new SIMs, each line now counts as additional line to the account. So I am not sure how to convince these people that I should not be responsible for their poor record keeping and how to properly give contract agreements. Everything is done verbally and we are just suppose to take their words on it. Yeah, go look it up yourself on MyTmobile, it’s all there. BS. I need a written contract on what my plan is and how much it costs and how many lines are covered. I’ll go to the Store soon to try to resolve this face to face with a person and get something in writing. What a terrible way to do business. Same here. I expected not much of a change in my bill since these 2 added lines were supposedly “free”. Six months later the issue is still not fixed. They keep giving me bill credits but I have to call every month in order to receive them. And another thing, they keep insisting that all their plans are with unlimited data, well its not the case anymore in 2017.